Jake Ball can’t wait to play in front of his friends and family when Notts Outlaws take on Northamptonshire Steelbacks at Welbeck Cricket Club’s John Fretwell Complex on Sunday. The 27-year-old paceman missed last year’s Royal London One-Day Cup victory over Leicestershire at his home ground on England duty in the Champions Trophy. 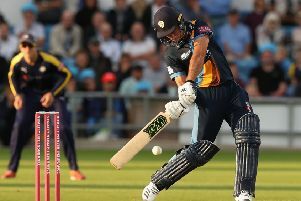 But he is set to be available when senior county cricket returns to the north of the county in the form of a 50-over match – and is determined to make a positive impact. “Not many people get to play at their home ground for their county, so I’m really looking forward to playing at Welbeck,” said Ball. “I have done it once before, which was a great experience, and I know the other lads enjoy playing there as well. “It would mean a lot to me to be in the wickets in the Northants game. I took a couple on the game last time against Warwickshire, which was the first time my granddad had got to watch me play for the county because he doesn’t get the chance to go to Nottingham. In three previous visits to Welbeck in 2015, 2016 and 2017, Notts have been victorious on each occasion against Warwickshire, Derbyshire and Leicestershire. Those matches have all seen Notts score quickly and use any pace in the wicket to good effect on a wicket that has seen a good battle between bat and ball. Ball added: “It’s always a good pitch, a good cricket wicket. We’ve had a couple of early starts where naturally it will do a bit early on, but once you get in, it’s a fast outfield and a decent wicket, where you can score quickly. “The facilities and dressing rooms are really good as well. It’s obviously not Trent Bridge, which is Test-match standard, but it’s pretty close. Tickets are available for Sunday via trentbridge.co.uk/tickets, or you can call Welbeck on 01623 847468 or Notts on 0115 8990300. They are priced at £12 for adults, £9 for seniors and U21s and £5 for juniors.